It shows a white mantle shading to grey at the shoulder and thigh levels, yellowish medium-sized horns with black tip; the frontal hair tuft may have some reddish shading as it comes from dark golden cattle. Another typical characteristic of some Italian white breed is the so-called ‘cut’, that is a pink coloured reversed V in the centre of the dark grey wide muzzle. Depigmented skin, medium-small size and height. 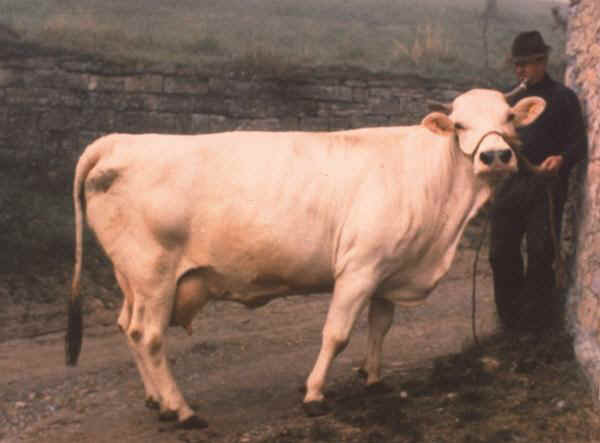 This breed was originally used for milk, labor and meat but throughout the years it was mainly selected for milk production.